Now that Summer is over, you’re bound to have a bunch of pool noodles leftover. If your pool noodles are worse for the wear and you’re considering getting new ones, don’t throw your old ones away! 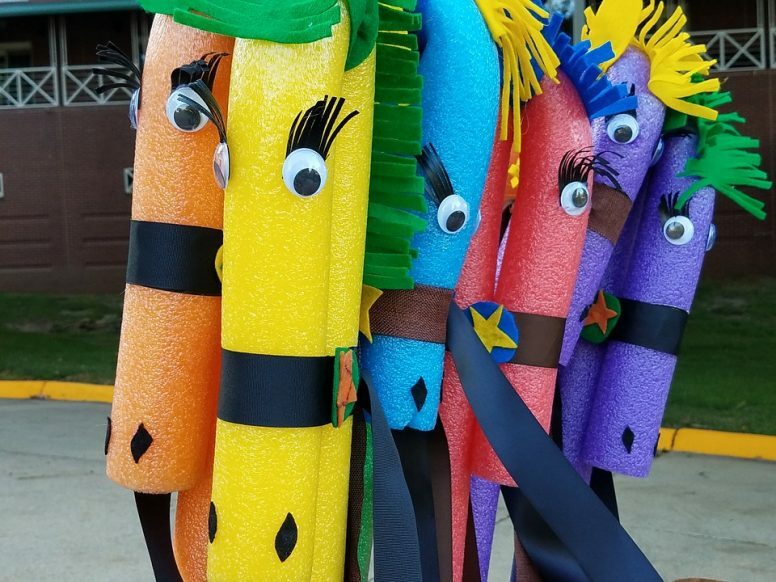 Consider making these DIY pool noodle crafts that are clever and creative instead. 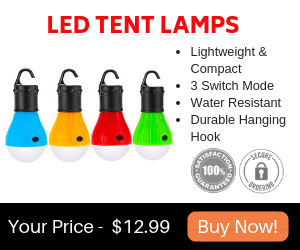 They’re tons of fun and your kids will love playing with them. 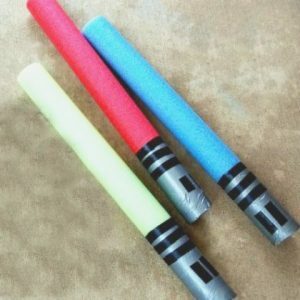 Duct tape a flashlight to the bottom of a pool noodle to make a DIY lightsaber. When you turn the flashlight on, the entire pool noodle will glow. Your kids will love using their lightsabers to pretend like they’re real-life Jedis. They will be able to use their imaginations and have a great time together. Pool noodles are also really soft so they won’t hurt when your kids get hit with them, which is inevitably going to happen. This is an easy and fun craft to make. Simply cut the pool noodles in half lengthwise. You’ll have a half-pipe shape. 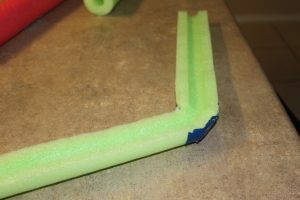 Then use legos or blocks to set the pool noodle pieces on top of. Then put marbles inside the pool noodle pieces and they’ll all roll down. Your kids can design their own marble run and see who can make the biggest one. Or have a marble race. This pool noodle craft is fun because your kids can totally create their own run. Again, super simple. Put a stake into the ground then put a pool noodle piece over the top of the stake so that it stands up straight. 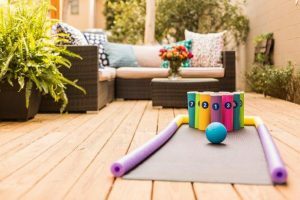 Now all you have to do is toss rings onto the pool noodle! Easy as can be. This would be a really fun activity for a Summer birthday party! Or it doesn’t even have to be for a special occasion. It can simply be just for the fun of it. Cut some pool noodles into small sections and stick popsicle sticks in the ends of them. They look like little popsicles! This is such a cute decoration. 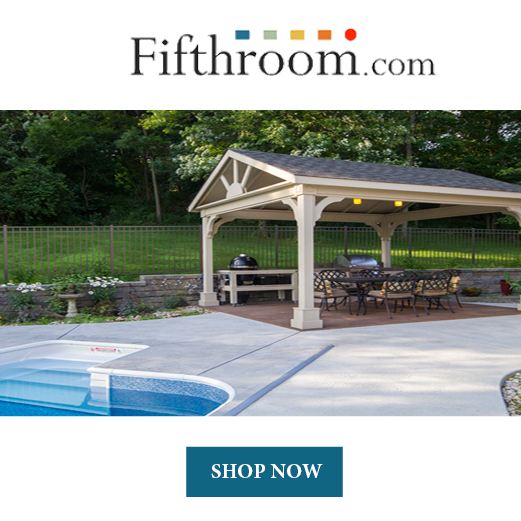 It can be used for birthday parties, barbecues, and fun family parties. It’s fun, festive, and colorful. String the pool noodle popsicles together with some clear fishing line so it looks like the popsicles are floating. 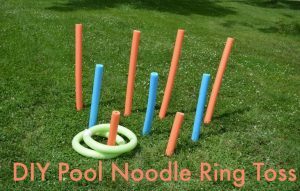 Make a backyard bowling alley with pool noodles. Just put a yoga mat down, then tape pool noodles to the edges of the yoga mat. The pool noodles will create bumpers. 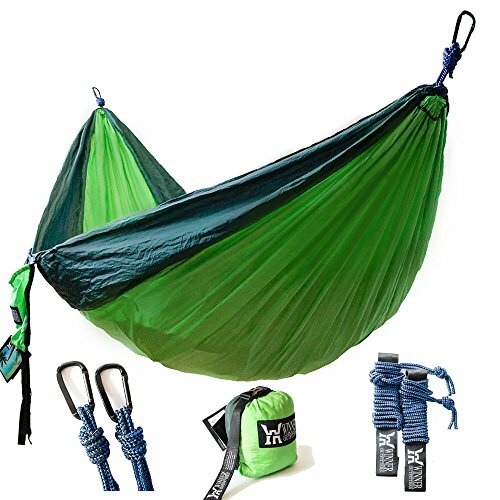 Now all you need is a beach ball and some soda bottles. Use the beach ball to roll down the yoga mat and try to knock down as many soda bottles as you can. Pool noodles make great stamps. Just create any shape you want out of the pool noodles. 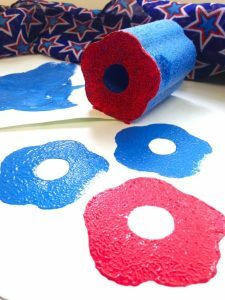 Then dip the end of the pool noodle piece into some paint and push it against some paper. It’s really easy to create apple shapes, pumpkin shapes, hearts, or stars. Your kids will have fun stamping and painting. Save yourself some money and don’t buy new stamps. Just use old pool noodles. There are so many DIY pool noodle crafts to try. All of them are simple and easy. Your kids will love recycling their old pool noodles into something fun. 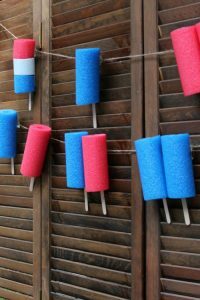 Try these DIY pool noodle crafts with your old pool noodles to give them new life.